When individuals experience trauma or significant life stressors, it is not uncommon to feel overwhelmed or as though things are coming apart at the seams. Caitlin’s passion is to assist people in feeling a little less overwhelmed and in becoming a little more put back together each week. 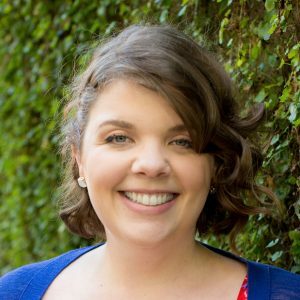 Caitlin works with children, adults, couples, and families who wish to move toward feeling content, whole, and safe– both within themselves and with each other. Caitlin received her master’s degree in Mental Health Counseling from Monmouth University. She currently holds licensure as a Licensed Professional Counselor and holds certificates as a National Certified Counselor and a Certified Clinical Trauma Professional. Caitlin has been trained in several evidence-based trauma-informed therapy techniques, including training in Trauma Center-Trauma Sensitive Yoga. Caitlin utilizes empathy, humor, and mindfulness in all of her sessions. Prior to receiving her master’s degree, Caitlin worked as a mental health technician for a psychiatric hospital and as a case manager for individuals with serious and persistent mental illness. These positions allowed Caitlin to hone her skills in crisis management and to see the efficacy of empathy and patience. In addition to her work at Temenos, Caitlin holds a position with an agency in Mercer County providing therapy services to underserved individuals and families impacted by trauma and violence.